Memories by AmyInKy: It's Finally Friday! I hope this weekend will allow me a little time to get caught up on uploading/editing my photos. I'm way behind on that. I have a couple fun little projects to share with you today. When going through my stash last month, I came across the "Apple Jack" line by Sassafrass Lass that I purchased almost a year and a half ago. I was dying to work with this line, but it just sort of sat. For a long while. While I had the line out, I also scrapped our nephews' birthday party from a couple years back. 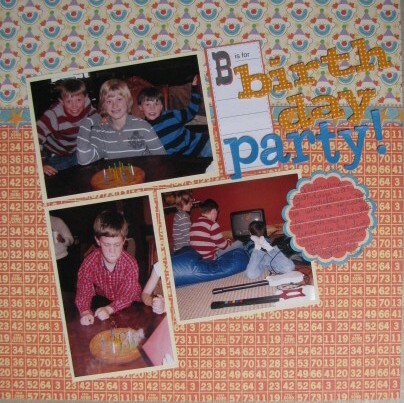 I've been scrapping a lot of birthday layouts lately. Afterall, this is birthday season in our house. I'm looking forward to celebrating both boys' birthdays at their "friend" party this weekend. Those pictures are hilarious! Have a good weekend! I love these layouts! You always have the best stories and birthday layouts! 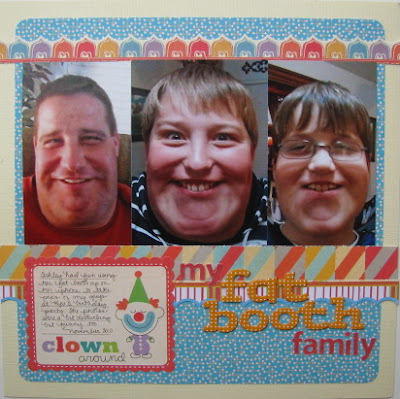 I noticed you didn't post a fat booth pic of yourself lol! I immediately destroyed the ones my son took of me...I didn't want them finding their way into the wrong hands! Great layouts...I love the funny pics in the first one. These layouts are perfect with the line. So sad Sassafrass is stopping production. those turned out so cute! I love the first layout!